Medal of Honor winner Charles H.T. Colllis is born in Ireland. The fifteen year old Collis arrived in Philadelphia with his father in 1853. He studied law and was admitted to the bar on February 4, 1859. At the start of the Civil War he joined the 18th Pennsylvania Infantry Regiment as sergeant major. Collis formed the Zouaves D’ Afrique, modeled after the elite Algerian troops of the French Army. The regiment became the 114th Pennsylvania Infantry, known as Collis’ Zouaves.Collis won the Medal of Honor for his bravery at Fredericksburg. Due to life threatening wounds received at Chancellorsville, he did not fight at Gettysburg. 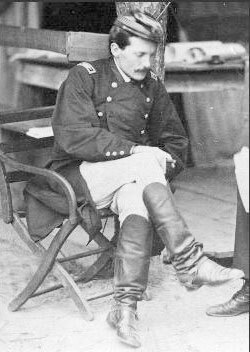 In 1865 he was breveted major general at Grant’s prompting. Following the war Collis built a house in Gettysburg which still stands on Seminary Ridge. He died on May 11, 1902 and is buried in the National Cemetery at Gettysburg, where he is honored by a monument. Collis’ wife who was from South Carolina and had family fighting for the Confederacy wrote a short powerful book about the war. “What better illustration of the abnormal condition of society in those days can be given than a statement of the fact that my daughter was born on September 25, 1862, and that her father, although within twelve hours’ reach of us, did not see her until June, 1863; – and he would not have seen her then, but that he was brought home, it was believed, to die. Careful nursing and desperate fighting by myself and one or two faithful allies restored him soon to health, and he returned to the front, – to find himself at twenty-five years of age in command of a brigade. This promotion was of course gratifying to my pride, but how much more did I value it when I learned that brigade commanders could have their wives with them in camp during the winter, while the unfortunate officers below that rank could not. Yet with all my joy at God’s mercy to me, some days came to me laden with great sorrow. My brother, David Cardoza Levy, a handsome, gallant lieutenant in the Southern army commanded by General Bragg, was about this time killed at the battle of Murfreesborough; seen by his companions to fall, his remains were never afterwards found, though General Rosecrans, to oblige my husband, made every effort to discover them. He lies to-day, God only knows where. The Provisional Confederate Congress convenes in Montgomery, Alabama. As many as 30,000 Irish born would fight on the confederate side during the civil war including Chaplain John B. Bannon. A number of Irish rose to senior leadership in the Confederate army including Patrick Cleburne and Henry Strong. 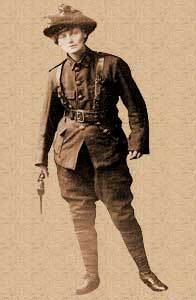 Strong was killed at Antietem while on the opposite Union side on that awful day, 540 members of the Irish Brigade were killed. 1868: Countess Markievicz is born in London. 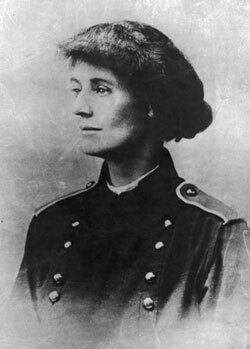 Markievicz was born Constance Gore-Booth , the daughter of landowner and philanthropist Sir Henry Gore-Booth and grew up at her family’s estate at Lissadell, in County Sligo. Her rank in Anglo-Irish aristocracy can be gauged by the fact that she was presented at the court of Queen Victoria in 1887. In the late 1890s she traveled to Paris, where she met Count Casimir Dunin-Markievicz of Poland; they married in 1900. Countess Markievicz was an arms bearing rebel during the 1916 rising. Her sentence of death was commuted to life imprisonment. As with most other surviving 1916 rebels, she was released in June 1917. She was the first woman elected to the English House of Commons, but she never took her seat. An Irish political activist, when elected Sinn Fein MP in the 1918 elections she instead joined with other Sinn Fein MPs at the first Dail, January 1919. She served Labor Minister in the first Dail (1919-1921. She was a bitter opponent of Anglo-Irish Treaty and supported the anti-Treaty forces in the civil war. She later joined de Valera`s party, Fianna Fail. She died in a Dublin hospital in 1927. 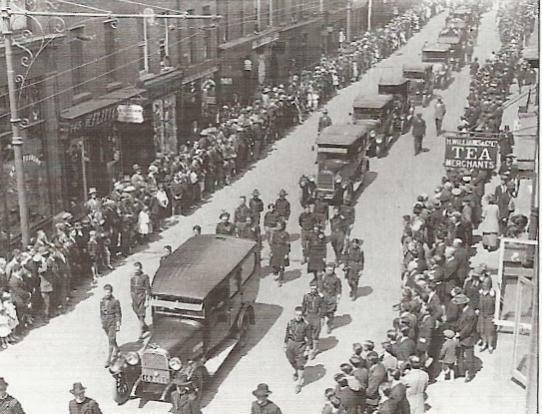 Her funeral drew huge crowds as it moved through the streets of Dublin. 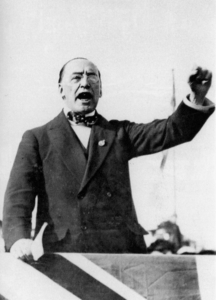 Edward Carson resigns as leader of the Unionist Party in Northern Ireland to be replaced by James Craig who would become the first Prime Minister of Northern Ireland. 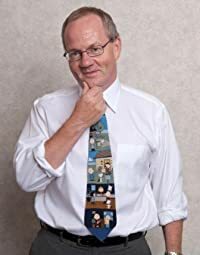 Carson was a hugely effective leader of the Loyalist / Unionist movement in Northern Ireland which felt under siege as Irish nationalism drove Ireland (relentlessly as he saw it) to Irish independence from England.In particular, his skills in organizing effective Loyalist opposition to a proposed 1912 Home Rule act ensures he is seen by many today as an Ulster hero. He was a founding member of the Ulster Volunteers whose objective was to preserve a Protestant Ulster for a Protestant People. 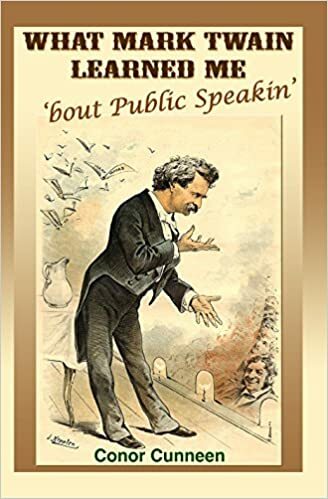 Carson was born in Dublin in 1854. A successful barrister, he led the case for the Marquess of Queensberry in his famous libel action against Oscar Wilde.